Facility: clean and short walk with some stairs down to the entry, eco toilets, showers, rooms to change, solid tables at the parking space and down at the entrance area. Dos Ojos has been for years operating their main cenote on a sustainable concept. I hope that their model behaviour sets an example for other cenotes. Dos Ojos has taken the right steps that dry toilets do not necessarily smell and you can keep them clean. Our rating in our scale from ∇ (bad) – ∇∇∇∇∇ (excellent) is therefore: ∇∇∇∇∇ (excellent). Dos Ojos is one of the best known cenotes in the area and probably mentioned in every travel book about the Riviera Maya. Thousands of snorkelers, cavern and cave divers enjoy the magic of this place every year. The 2-Eye- cenote has its name from the half-rounded shaped twin cenotes that are located very close together. 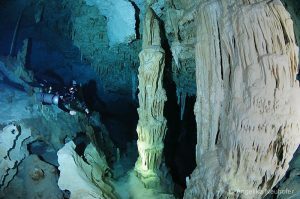 This cenote is also an excellent start into your cavern diving experience as the first dive leaves you at all times very close to a surface and exit. At any part of the dive you can easily abort the dive. You will see that the magic spell of the place will get you within minutes of the dive and you just will love it. We dive from the first eye to the second through a huge connecting tunnel and then along the second cenote into the upstream passage of the system. On our turnpoint you will find the famous Barbie and we head out and finish the dive where we started being on the way back a bit more in the already cavern like ambiance. The second dive will lead you into the Bat Cave area which is a huge airdome ventilated by a big hole in the roof – where the bats fly in and out. Snorkelers may enjoy a tour into the airdome by entering from the west eye (you need to be with guide). The cavern diver starts from the same platform as the first dive but this time the general direction is more to the left. As the opening in the ceiling of the bat cave is quite small there is not much daylight coming in, but also in this dive you always will be close to a surface and have a safe exit if needed. Your finning techniques and your buoyancy should be excellent as not to stir up too much sediment. There are many fossils to be found on that dive as well as to admire the beautiful formations. We will surface there and admire the bats before we head out to our start point.